Greater Ohio Area Superkids Classic, Inc. is a not for profit organization whose sole purpose is to ensure a safe and organized Soap Box Derby style race for children with disabilities, ages 7-18. This story begins in 1980 with the #34 Chapter of Vietnam Veterans of America. That year, this group took on a community project; they chose to work with the Akron Soap Box Derby, since it was local to them. Veteran Dave Mitan was working with the racers when a tug on his shirt caught his attention. As he turned around, Dave came face to face with a special needs child. Sitting next to a brother who was competing that day, the child asked, “Why can’t I do that?” Dave’s heart was so moved and his spirit so touched that he shared the experience with his fellow veterans. Together, the Chapter immediately scheduled a meeting with the All-American Soap Box Derby to design and build cars for these special children. 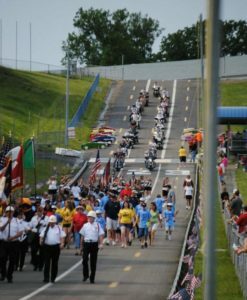 The following year, in 1981, the first race was held in Akron, Ohio on the same hill that hosts the All-American Soap Box Derby. Through the smiling faces and positive attitudes of these special children, the veterans were able to overcome many of their own debilitating war experiences. Thus the event was named the “Super Kids Classic,” as they were indeed “Super Kids.” The local Akron race later became and is known today as Greater Ohio Area SuperKids Classic, Inc. In the years that followed, the Akron veterans traveled around the country sharing their “Super Kids” experience. They detailed the project, gave advice, and passed out handbooks, which included blueprints for the cars. At the Vietnam Veterans of America National Convention in 1989, a resolution was passed to allow local chapters across the nation to hold races in their communities. Every year as each local Super Kids Classic committees worked to put on their own events, a much larger dream was gaining momentum. They wanted to give their Super Kids the chance to compete in a national competition, where they could challenge others like themselves from across the nation. On August 9, 2003, that dream became a reality in the derby hometown of Akron, Ohio. Thus it was that Derby Downs became the home of another wonderful race: the National Super Kids Classic, Inc.
We, at the Greater Ohio Area SuperKids Classic, Inc. would like to give a very sincere thank you to everyone who made this event possible—from its origins as an idea to the event it has become today. The long hours, hard work, and community contributions will be remembered with each smiling face as one of our Super Kids crosses the finish line.